Notes: The next novel I write is probably going to be epic fantasy again despite the fact I had been taking a break from epic fantasy. But I wrote a magical realism novel (100 Years of Blood) and now I'm feeling the urge for epic fantasy again. To help get me in the mood, I turned to this little paperback I've had in my to-be-read pile for some time now. 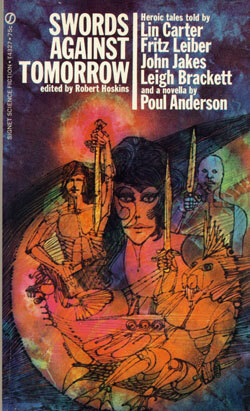 It features heroic fantasy tales by Lin Carter, John Jakes, Leigh Brackett, Poul Anderson and Fritz Leiber. This was one of the very first of a string of Sword & Sorcery and related anthologies from the 1970s, and I've long wanted to get into it despite the fact I've probably read some of these stories in other collections at one time or another. Here's to hoping this helps keep me in the epic fantasy mood! Mini review: It took me longer to read this one than I had expected, but I wanted to take these stories slow and savor each of them, re-reading in some places. It would be difficult to pick out a favorite. I will say it's too bad John Jakes doesn't write more fantasy stories. Also, I would be surprised if Leigh Brackett's Roy Campbell character from the story "Citadel of Lost Ships" was not an influence upon the Han Solo character, especially considering Brackett was known as the "queen of space opera." For those who enjoy Sword and Sorcery, as well as Sword and Planet, fiction, this collection should be right up your alley. I have a copy of that somewhere. Like you, I've probably read most of the stories elsewhere but have never read that particular collection. I'm looking forward to what you have to say about it. One of my favorite collections. IT has a prominent place in my collection.